la casa de papel – After five months of preparation by the “Professor”, the biggest robbery in the history of Spain has begun. It’s been 72 hours since you entered the Mint and you have been surrounded by both the police and the Special Forces. While it is thought that everything is going as planned, all the money that has been printed so far has disappeared. One of the hostages has set out to spoil the “Professor’s” perfect plan. Will you be able to find the 563 million euros lost on time, before it derails the plan entirely? 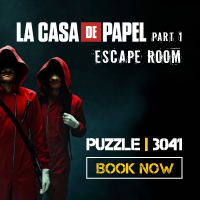 Book la casa de papel today! 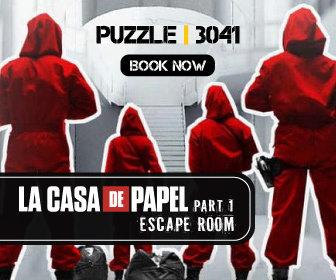 La casa de papel is a Spanish TV Series created by Álex Pina in 2017. All episodes are now available on Netflix. The series deals with the biggest heist in history, the takeover of Spain’s Royal Mint. A diverse group of criminals occupy the mint, with the ultimate goal to print 2.4 billion untraceable euro banknotes. The mission must be accomplished in just 10 days. No Killings. They want to appear to the world like modern Robin Hoods, as they want to win the battle for public opinion. No Personal Relationships. To prevent psychological attachments and allow the members of the group to continue their life after the robbery is done. No Names. Every member of the group has a nickname, taken from big cities around the world.